Pope Francis recently visited Naples, where he was present for a "miracle" which is regularly performed by the local bishop there, in which what is allegedly the dried blood of a long-dead saint is made to turn liquid before a crowd of assembled worshipers. Rosa Rubicondior has the details. The way in which the liquefaction is done is well understood. The material in the container is not blood but a mixture of easily-obtained chemicals which is normally dry and brownish but turns liquid when shaken. In other words, the "miracle" is a trick -- conscious and premeditated fakery, an intentional scam knowingly performed to fool gullible believers. It's hard to imagine that Francis is unaware that the miracle is fake. He's the top man in the Catholic Church; the "miracle" is a renowned one which has been performed since the 14th century; the information about how such tricks are done is widely available. Yet when this scam was repeated in his very presence, he let it pass without comment. For that matter, even before visiting Naples he was no doubt aware of this and other cases of conjuring tricks being passed off as authentic miracles to impress the credulous. He has done nothing to suppress, much less expose, the use of such deliberate deceptions to enhance the Church's prestige. Francis has won praise from some liberals in our country for a few extemporaneous remarks which sound less hostile to gays and other "sinners" than the Church has traditionally been (and these remarks have also aroused alarm among more traditional / bigoted Catholics). But there has been no substantive change. And Francis has shown no interest in dismantling the vast framework of lies and trickery, of which faked miracles like this one are just one example, which the Church uses to maintain its prestige and back up its supernatural claims (here's another case of obvious deliberate lying about something very easily checked), and to keep the rubes donating from their meager incomes to top up its vast wealth. Apparently he is not only quite comfortable with such scams, but also fairly confident that God too finds them acceptable. About the worst Catholic scandal of all, the systematic cover-up of child molestation by clergy and the world-wide pattern of shielding the molesters from prosecution, Francis has similarly made some noises that sound good, but has not taken the one step that would actually be meaningful -- a clear and firm directive that accused priests must be turned over to civil police and courts for trial rather than dealt with through the Church's internal disciplinary procedures. So, where Francis is concerned, liberals should focus on substance rather than being impressed by a few examples of friendly-sounding but empty rhetoric. The Catholic Church is an irredeemably evil and corrupt institution. It won't change because of one man who, on all evidence, doesn't want to change it anyway. It won't change, period. It can't. It is what it is. Oh, I'm sure that the Pope and many members of the Magisterium know it's all a sham. They enjoy their wealth and power and see the laity as serfs. It disappoints me that in some quarters, these parlor tricks are what pass for spirituality. It's not indicative of a deep or mature spiritual life, whether the "miracles" take place in a Catholic setting, a New Apostolic Reformation setting, etc. Ahab: Pretty much everything that goes under the heading of "spiritual" is a fraud of some kind. What baffles me is why so many liberals were so easily bamboozled by Pope Francis (although a lot of those who had depicted him as a reformist have gone kind of quiet more recently). Like most wealthy, powerful organizations, the RCC doesn't want to damage their brand. Exposing trickery for what it is, would call into question all the other so-called "miracles" that the RCC has let their followers believe in. This reminds me of an old Father Sarducci skit where he was complaining about Pope John Paul II's favoring one holy person over another for sainthood. Father Sarducci said the favored person wasn't eligible for sainthood because in order to be passed off as a saint in the RCC, a person has to have performed 3 miracles. 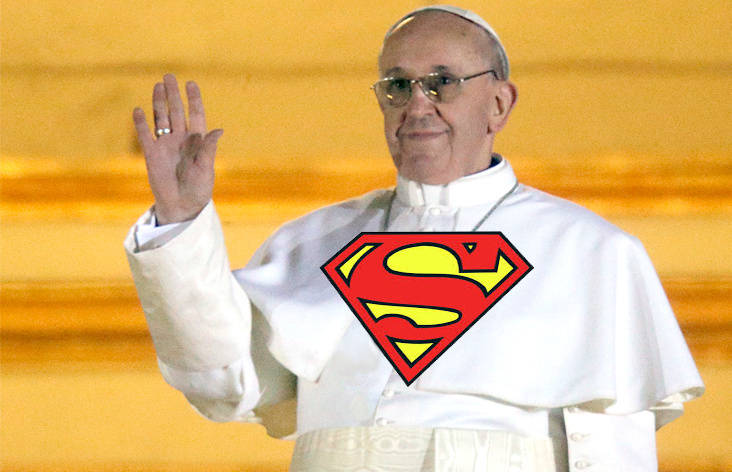 Father Sarducci claimed the the guy Pope JP II favored had performed only one miracle. The other two were just card tricks. Dried blood, flowing blood, card tricks. Is it a church or a carnival? Certainly the Church as an institution can't come clean, as you say. Their whole schtick would start to unravel as soon as they admitted any part of it was a scam. But that's why Francis is an apparatchik and not a liberal. No true liberal would ever be allowed into that position. Secular liberals are fools if they think it will ever happen. Of course, this means the Church continues to embrace obvious fraud and to talk about silly nonsense like "miracles", guaranteeing its continued decline among all but the most credulous (and truculent). "It's hard to imagine that Francis is unaware that the miracle is fake." Even more so because he has a chemistry degree, a fact that struck me when I put together Where the Catholic Church stands on science and the environment. He really must know better. As for why American liberals like him, in addition to what he says and how he says it, I think it has a lot to do with who he's not--a former member of the Hitler Youth who looks like Emperor Palpatine. After him, Pope Frank is an improvement. I didn't know he had a chemistry degree. As you say, that makes it all the more inexcusable. Of course, he has power and prestige at stake, but his hypocrisy should bother us even if it doesn't bother him. I see your point about He Who Zings Rats, but I'm not sure the improvement is more than cosmetic.